Since I just reviewed Full Throttle, one of my new all-time favorite games, I decided to tackle another one of the adventure games I picked up during my adventure game craze. So, who has seen Who Framed Roger Rabbit? Anchors Aweigh? Disney’s Mary Poppins? Or what about the critical flop, Cool World? One aspect of these movies that I always found amazing is the technology used for the scenes where a cartoon character was placed in the human world or a human character was in the cartoon world. I know there is some explanation in how they did this, but I just wanted to say that this technique used in certain films has a special place in my heart. So, what do you do when you take the last third or so of Who Framed Roger Rabbit and combine it with Christopher Lloyd, a list of amazing voice actor from the 90s, and Tim Curry? You get the cult classic and highly enjoyable, Toonstruck. 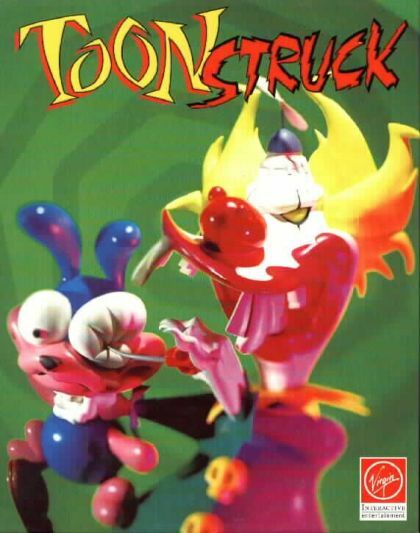 This game was developed by Burst Studios and published by Virgin Interactive, Toonstruck was a unique adventure game for its time and is one that is remembered by many adventure game fans. Unfortunately, like its Neverhood and Grim Fandango brothers, it didn’t sell well even though it was highly praised. How about we dive into this zany cartoon world, and review one of the best adventure games around? The story revolves around a cartoonist named Drew Blanc, played by Christopher Lloyd. He is a cartoonist that is pretty burnt out on work, and ends up late at a meeting he needed to attend with his boss. His boss is named Sam Schmaltz and is played by Ben Stein, which to me is perfect casting to play a dry buzzkill boss. Anyway, Sam wanted to talk to Drew about the show that he has been working on for such a long time known as The Fluffy Fluffy Bun Bun Show. Instead of killing off the show after 10 years, Sam wants Drew to make a new show called Fluffy and Friends. Drew in a burnt out state of mind and really not wanting to work on this show, wishes he could make his own cartoon show with his own cartoon character, Flux Wildly. Drew then falls asleep and wakes up a few hours later to have the usual incidence of getting sucked into his TV during a late-night showing of the The Fluffy Fluffy Bun Bun Show. What? You never got sucked into a cartoon world at four in the morning? Anyway, Drew is now in the land of Cutopia. Drew is then saved by his very own cartoon character, Flux Wildly, voiced by Homer Simpson himself, Dan Castellaneta. Flux decides to help Drew get back to the human world by taking him to the king of Cutopia, King Hugh, voiced by David Ogden Stiers. The king is willing to help Drew with his issue, but only if he helps the land get rid of an evil villain known as Count Nefarious, voiced by the enjoyable Tim Curry. Drew needs to help make a machine to counter act Nefarious’s plans of making all of Cutopia evil and grim. The story is very enjoyable and is more like a cartoon made for adults, but not taken as far as, say, South Park. The characters are memorable and the voice cast is great. I also feel connected to Drew as a character, since I think anyone has had that feeling of being burnt out on doing one thing for a very long time and wanting to do something new, but something is preventing you from doing so. I know I have. The story also has a really interesting twist around the half-way point of the game, and it just helps spice up the fun and energetic story. As far as adventure games go, it is an inventory puzzle-oriented adventure game like Full Throttle or The Curse of Monkey Island as you go through three major areas of Cutopia. There is, of course, the main area, Cutopia, The Bad Lands, and Zanydu. You will go around the three lands as Drew, with Flux traveling by your side, gathering items and solving puzzles using said items. The major puzzle to solve for the first half of the game is to find items for a machine called the “cutifier”. The main gimmick with this puzzle is to find not the same items that are in the machine, but ones that correspond with the items in Nefarious’ machine. For example, one of the items in the machine is salt, and you need pepper, or another item is whistle, so you need bells. The puzzle is basically a bunch of terms and phrases used by people in conversations. For some of these puzzles, you have to sometimes think like a cartoon character. A perfect example of this is when Drew and Flux get captured (if you let them get captured) by Nefarious’ three goons, and are stuck in an electric lock prison cell with a fur carpet. What do you do? Well, put yourself in the mind of a cartoon character and figure it out. While there is some crazy logic used here, it fits. It isn’t out of place for this universe to run on cartoon logic. Sometimes I run into a puzzle I don’t really care for, but for the most part, it took me three hour or so to beat the game. I know adventure games do not have replay value, completionist extras, and other things to keep you coming back, but what about the game just being fun to go through? Graphically, I think most of the game holds up. Some of the animations look a bit dated, and Drew’s digitized model is obviously very compressed and pixelated. Maybe it would have been better for him to turn into a cartoon also, but in the end, everything looks nice. The world is bright and colorful, wacky in design, and fun to look at. The characters are way too memorable for their own good. I think it helps that they have fantastic voice actors behind them. You have voice actors like Frank Welker, Jim Cummings, Rob Paulsen, Tress McNeille, the late Dom DeLuise, Jeff Bennett, Corey Burton, and April Winchell. I think anyone in the 90s and even now would know these voices from cartoons like Transformers, Animaniacs, anything Disney related, and anything Don Bluth related. The music is a mixed bag of cartoony style music. It is wacky when it needs to be, peaceful when it needs to be, spooky when it needs to be, and you get the idea. Like every game out there, this one has its issues. This first complaint is just personal taste, since I didn’t care for some of the puzzles that were given to me, like the fixing of the Zanydu clock or the small slider puzzle in The Bad Lands. This is just a minor complaint since puzzles can be subjective. Like I said above, some of the graphics in certain parts of the game don’t age well either. I also didn’t care for the walking back and forth between areas for the first part of the game. What I mean by this is that Drew walks rather slowly, and there is no way to change the walking speed within the game. Luckily, you get an item later on where you can move faster between all three locations. In the end, Toonstruck is a fun adventure game. It definitely stood out among adventure games with its hand-drawn animation and very amazing voice cast. Sure, some of the logic and puzzles might need some out-of-the-box thinking, but I don’t think this game is hard to get into at all. There was a sequel planned, but was canceled. It was going to have a lot of the content Burst couldn’t get into the first game, due to time constraints. I have seen petitions online, and the original creators talk about getting it back up and running, but there are some legal issues to sort through first. Getting a copy of this game can be rather easy if you are not looking for the complete box copy. I only got the two discs and the CD case it came in when it was released, and it only cost me $6. It can cost more, but I would say look around ebay for it, and you should find a copy of the game for the right price. You can also run this game on the scummVM program that helps gamers run a majority of LucasArts games on current PCs. I bet if they got through the legal issues they could do a sequel for the game on Kickstarter or maybe even just skip dealing with the legal issues and make a spiritual sequel. If you are looking to be in a good version of a Who Framed Roger Rabbit or Cool World video game, drop a few dollars and get yourself a copy of Toonstruck! This game get an 8 out of 10.